The USD/JPY pair has been moving sideways over the past few days. On Tuesday, Japanese Prime Minister Shinzo Abe’s talks with US Deputy Prime Minister Michael Pence were in the spotlight of Japanese investors. During a meeting with journalists, Pence noted that American goods and services still encounter many obstacles in the Japanese market, and therefore cannot compete normally. The officials consider a trade agreement to be the best way out of the situation. Recall that the deficit in US trade with Japan currently stands at about $69 billion. Today, the yen is weakening against the US dollar. Japan's GDP in the third quarter fell by 0.3%, confirming expectations. Annual GDP data, published today, turned out to be lower than forecast, recording a decline of 1.2%. The yen is also under pressure of the reduction in the index of activity in the services sector by 1.1%. Today October data on the consumer price index in the United States will be published. The base rate is expected to grow on a monthly basis from 0.1% to 0.2%, while in annual terms it will remain the same level of 2.2%. The growth of the index can positively affect the dollar, giving the USD/JPY an additional impetus to growth. High volatility is expected in the market. Support levels: 113.81, 113.65, 113.55, 113.39, 113.19, 112.93, 112.70, 112.55. Resistance levels: 114.09, 114.19, 114.30, 114.53. 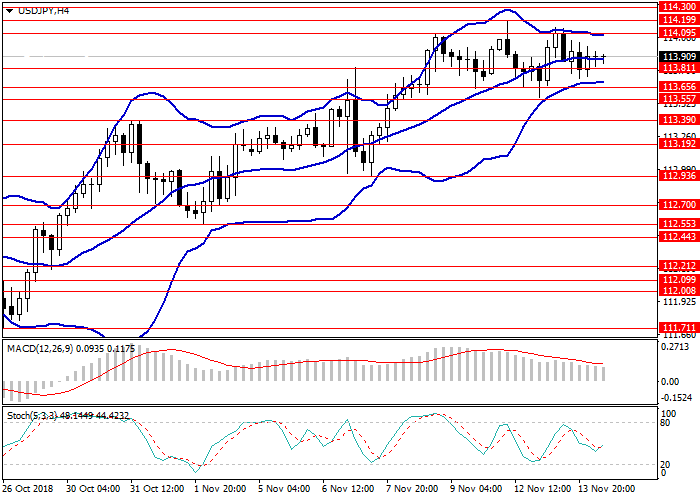 Long positions can be opened at the current price with the target at 114.50 and a stop loss at the level of 113.60. Short positions will become relevant at the level of 113.50 with the target at 112.93 and a stop loss at 113.81.